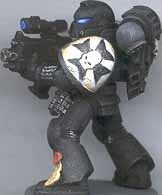 Robert Calfee took it upon himself to paint up some Black Templars, and has done quite a nice job. This is his scout sergeant, painted with red details instead of white to help distinguish him from the rest of the scouts. 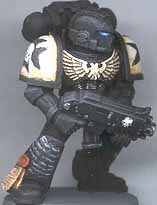 I also recommended adding the space marine backpack to help with the distinction. A typical scout. Notice the reversed colors on the shoulders. Robert painted these crosses by hand. Also worth noting is the contrast between the cloth parts (off white) and the shoulders (pure white). This kind of subtle color depth can go a long way on such monochromatic color schemes. 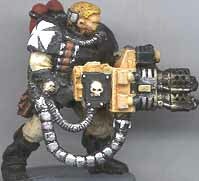 A nifty conversion is this heavy flamer scout. 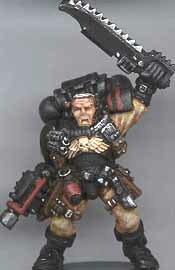 Robert started with a shotgun scout, chosen for the respirator mask, and added fuel tanks to his back from the vehicle accessories sprue and a heavy flamer from the Adeptus Sororitas. 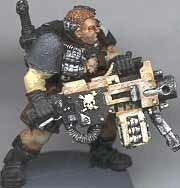 A heavy bolter scout, basically stock, but nice for comparison with the above model. This flamer marine is made entirely out of stock plastic. Amazing what you can do with just a bit of posing and a nice paint job! The Sergeant is also made from stock plastic. 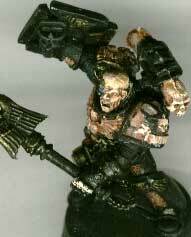 Robert has put some brown shading into the shoulder pads instead of stark white, and it looks great. The face is also nicely painted, with the scar across his left eye well accentuated. Another nice pose, this time with the marine peering down at an auspex. 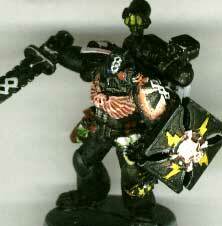 The eyes were painted blue and highlighted with white- a nice contrast to the black armor. 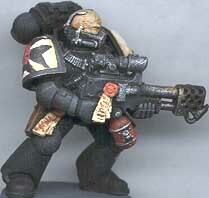 Another stock model, with the head turned to match the bolter. Just adding a targeter can really make a model look menacing, especially if the lens is painted up as well as the eyes are. Notice the tiny white text on his forearm. Another stock model, this time with a different chapter icon on the shoulder. 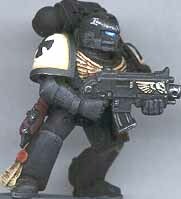 Small variations in chapter icons, armor style, weapons, and even colors can add a lot of personality to your marines and keep them from looking like they just rolled off an assembly line. This model has some great shading on it- the black is nicely highlighted with grey drybrushing, and the white bits have a smooth brown shading on them. Notice the litanies on his right leg, and on the purity seal. 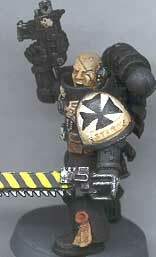 A converted Chaplain, nicely posed. The crozius used to be in the right hand, but the pose is ideal for a shield. Putting the Crozius in the left hand gives this model a very dynamic look. Good grief! Robert didn't like the pose on the Emperor's Champion model, so he turned him into a rather nice standard bearer! The banner is paper with one of those Empire Shield bosses glued onto it. I don't know where he got the standard top from, but I like it. The backpack is Azrael's, complete with banner pole. 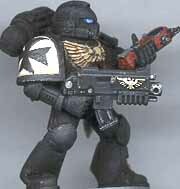 The Black Templars colors paint up quickly, but even this simple color scheme can come out looking great with just a bit of shading as Robert has done here. 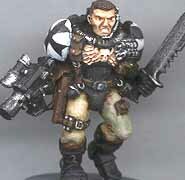 Another cool conversion, this time a medic. The addition of a power sword and storm shield makes this "support" model a formidable foe in melee!